Greece’s parliament will convene for an emergency session to ratify the text of a new multibillion-euro bailout, according to the parliament website, but the timing of the crucial vote remained uncertain and doubts persisted about whether the deal enjoyed the full support of all EU capitals. It was not clear when MPs, recalled from their summer recess on Tuesday by prime minister Alexis Tsipras, would begin discussing the 400-page bill at committee level, with reports suggesting that parliamentary committees would probably not meet until Thursday morning, hours before the plenary debate and a vote now likely to take place in the early hours of Friday. Tsipras called for parliament to reconvene after the government reached an outline agreement with its creditors early on Tuesday on an €85bn (£61bn) package aimed at saving the debt-stricken country from bankruptcy and securing its future in the euro. The government wants parliament to ratify the bailout, Greece’s third in five years, so it can be approved by eurozone finance ministers at a meeting planned for Friday – allowing a vital first tranche to be disbursed in time for a major €3.4bn debt payment Athens is due to make to the European Central Bank on 20 August. But while initial reaction to the agreement was positive in Brussels and many EU capitals, there were concerns the deal may come unstuck, with the Ekathimerini reporting that the deal could run into opposition, particularly in Germany. “The Greek government’s greatest concern is that German finance minister, Wolfgang Schäuble, will reiterate his opposition to a deal and insist Greece should instead be granted a bridging loan” to allow it to meet its €3.2bn debt payment to the ECB on 20 August, the newspaper said. Citing government sources, it added that the German chancellor, Angela Merkel, worried about the domestic political fallout, had made similar noises on Tuesday in a conversation with Tsipras, saying Germany was “sceptical” about the agreement and wanted a bridge loan instead of a full agreement, which she suggested required more detailed discussion. The AFP news agency also quoted EU sources as saying that while a technical agreement had been reached, political agreement was not yet certain and it was far from sure the deal would be finalised by 20 August, meaning Athens might need emergency funding to pay its ECB debt. “We might need a few days’ bridging funding,” one EU source told AFP. “In that case, we need all the member states” to approve the loan. The outline deal requires Greece to impose a raft of 35 fiscal and other market reform measures, from overhauling the gas market through liberalising pharmacies to selling off state property, revamping the welfare system, opening up closed professions, scrapping most early retirement schemes, cutting fuel price benefits for farmers and raising taxes. If it is approved, the draft agreement would bring to a close a bruising chapter of negotiations between Greece and its creditors: the ECB, International Monetary Fund, European commission and European Stability Mechanism. 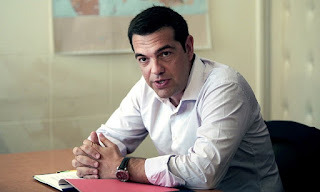 Tsipras’s leftist Syriza party, which swept to power in January elections promising to end the austerity programmes that have plunged Greece into deep recesion and pushed unemployment to a record 25%, has had to make a painful policy U-turn. A sizeable bloc of dissident Syriza MPs is likely to oppose the package in Thursday’s vote, which all deputies are required to attend. The rebels argue that the agreement is “a noose around the neck” of the Greek people and the country’s economy as well as a betrayal of Syriza’s campaign pledges. But support from Syriza’s coalition partners and the main opposition parties will almost certainly ensure Athens ratifies the deal, which among other measures provides for an immediate €10bn cash injection for the country’s struggling banks.